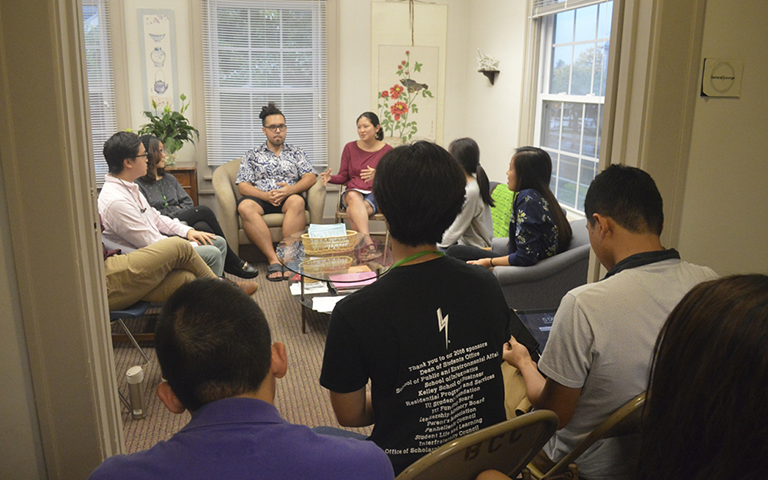 Despite the rain and loud thunderstorm in the background, about twenty students and IU faculty gathered in the living room of the Asian Culture Center to participate in a panel discussion at the ACC on Wednesday. But the topics covered were not strictly about being Asian American at college and at IU, the conversation revolved largely around Asian and Asian American identity on campus. Discussion facilitator and ACC program associate Sarah Stamey said they picked this topic because of current events and because it would provide fruitful discussion. The discussion was mostly fast-paced, filled with participants’ personal stories and experiences on campus and within Bloomington as it related to their Asian American and Asian cultural identity. While there was a moderator, panelists sophomore Joy Zhao and Malina Xiong, president of the Asian American Association, provided insight into the topics, encouraging the audience to participate. A hot topic was understanding Asian American student identity versus the Asian identity that international students have. For Xiong, she found it unimportant to differentiate that she is Asian American. “I have no need to emphasize that I am Asian American,” she said. But for many of the other discussion participants, they said it can be a struggle to identify who they are because how long they have or have not lived in the United States. Stamey also brought up the idea of being “too Asian to be American or too American to be Asian” and understanding how it affects developing one’s identity. The discussion of generalizations and micro-aggression toward Asians and Asian Americans on campus also came up. Xiong said she has had someone use a racial slur against her more than once. One audience member brought up the idea that where many international Asian students come from, they are the majority race, and at IU they are a minority. There is a dominant culture that these students have to put up with or adapt to, which can be an issue, she said. This idea of new culture came up when the group also discussed the different cultures around IU’s campus with respect to both IU culture and American culture. There was also passionate discussion on their respective stories of assimilation and experiences with U.S. culture. Possible solutions offered from the group to these various identity issues included moving international student orientation to the same time as other students orientation and offering mentoring between domestic and international students. “Everybody should be more open-minded,” Xiong said.